Serbian media have managed to turn the news of the historic visit of Albanian Prime Minister Edi Rama into a choral campaign against him. There are differences in attitudes between the mass-circulation tabloids and serious newspapers, but anti-Albanian tones are visible and prominent everywhere. Rare attempts have been made to analyse the complicated relations between the two countries; stereotypes dominated on "us", the moderates, and "them", the extremists and provokers. "Rama spat against Serbs in the centre of Belgrade", "Edi Rama shameless Albanian [using the pejorative Šiptar]", "The four provocations of Rama in the heart of Serbia", "Vučić silenced the provoker", "Rama, this is not Tirana" – these are the titles of the first pages of tabloids Kurir, Informer, Blic, and Alo, that together generate the majority of the runs of the Serbian press. Titles in the newspapers Večernje novosti and Politika read "Rama has come to provoke" and "The new Albanian provocation". In the same issue, however, Politika also offered to its readers a serious analysis of the visit. Only Danas, a liberal newspaper of limited circulation, informed in the front page about the diplomatic incident which sparked the smear campaign. "Rama: Kosovo's independence is a reality – Vučić: Kosovo and Metohija belong to Serbia by Constitution". The difference in attitude between this paper and the other seven mentioned above is obvious. While Danas presents the information on what triggered the diplomatic incident, the other newspapers clearly suggest that the Albanian Prime Minister is a troublemaker. The tabloids have done everything possible to enrich the story with juicy details about Rama's private life and the visit itself. Photos of him on a nudist beach have been published, while news told that he wore shoes with heel lifts not to appear shorter than Vučić (both Prime Ministers are very tall). In an attempt to make Rama's allegedly provocative attitude even more obvious, one of the tabloids wrote that Vučić had to wait for as many as 27 seconds before the Albanian Prime Minister came out of the car to greet him. Such an attitude in informing about the very important visit of the Prime Minister of Albania in Serbia is linked to the government's inability to responsibly explain to the public the issues that affect the entire region because of Kosovo. The fact that Serbian media joined in an anti-Albanian campaign and in condemning Rama's statements, without serious efforts to thoroughly analyse the relations between the two countries, is yet another confirmation of the government's influence on Serbian media. Serbia does not recognize Kosovo's independence, but knows that Albania is its sponsor in the region. Prime Minister Aleksandar Vučić expected Rama to act sensitive and not mention Kosovo, but that did not happen. He reacted quickly and emotionally. The other Serbian politicians followed suit in their statements to the press, leaving the results of the historic meeting in the background. Serbian media obviously interpreted Vučić's attitude as a signal to start a tough media campaign, and the impression is that tabloids did so willingly, relishing the chance to increase circulation and sales. Of course there have been attempts to analyse seriously the visit, its meaning, and possible consequences, but only by a minority of print or electronic media. Free and clear discussion of different positions found space in social networks, especially Twitter. Even a cursory reading of newspaper front pages the day after Rama's arrival in Belgrade is enough to conclude that there is no separation between newspapers' editorial policy and the individual interests of publishers, politicians, and other power centres. Otherwise, we would have read reflections on the relations between Serbia and Albania, interests and differences that bind and divide them, and the reasons that led Rama to touch the issue of Kosovo during the joint press conference, in the presence of the Prime Minister of Serbia. Of course, Rama could have avoided mentioning Kosovo and thus contributed to a more constructive dialogue, but he probably thought that a statement of that kind would not have been too harmful and that the Albanian and Kosovar public, particularly its most nationalist and ultra-nationalist sectors, would have liked a clear message of support to fellow Kosovars. He knew, however, that the Serbian side would not be pleased and Vučić would react. Therefore, he listened to Vučić's reply without discomfort and nervousness, trying to stay focused on the future of relations between the two countries. 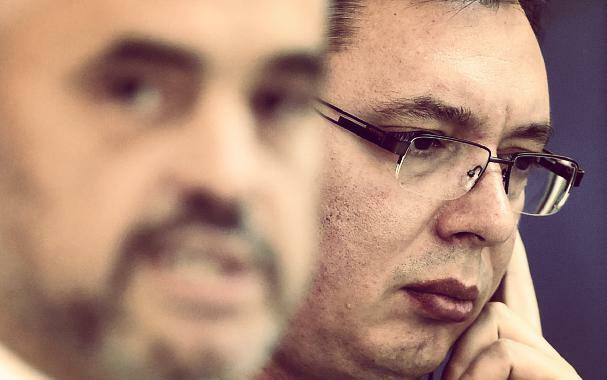 Vučić, of course, could also have reacted with more diplomacy and less emotion. However, much more than Rama did, he had to consider the impression the episode would make on the electorate, especially its nationalist and ultra-nationalist parts. As his political roots are in the ultra-nationalist Serbian Radical Party (SRS), he could not accept for the Albanian Prime Minister to assert Kosovo's independence "in the centre of Belgrade". The combination of the attitude of politicians, unable to deal responsibly with the huge problem of Kosovo, and the Serbian media campaign brings the whole issue of Kosovo a step back, to the time when Belgrade refused to accept any contact with the Kosovo government and “punished” neighbouring countries which recognize the independence of Kosovo with the withdrawal of ambassadors. Although most EU countries believe that Rama behaved provocatively during his visit to Belgrade, they certainly cannot accept the reactions of the Serbian counterpart, as they know that a single sentence can be enough to set the atmosphere in Serbia back to the period before the negotiations with Kosovo and the signing of the agreement with Brussels. At the same time, media have been used to spread intolerance rather than to inform the public opinion objectively and correctly as well as to voice critical positions.